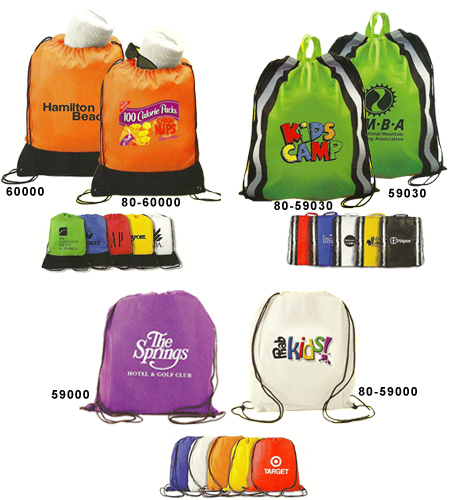 Custom Drawstring Backpacks with Your Design in One to Full Color! These Custom Drawstring Backpacks are lightweight and highly durable. The Custom Drawstring Bags range in size from 15" wide by 16" high to 16" wide x 19.5" high. All Drawstring Backpacks feature black colored drawstrings that securely enclose the bag contents. Three Custom Drawstring bags are available: standard Custom Drawstring Backpacks; Reflective Custom Drawstring Backpacks with 1" reflective side strips; and Two-Tone Custom Drawstring Backpacks that feature 4" black accent panels at the bottom of each Bag. Choose from either a one-color imprint or a full color digital imprint for your design. The minimum order for all our Custom Imprinted Drawstring Bags is 100 pieces. Production time is about seven to ten business days after proof approval. 60000 Two-Tone Drawstring Backpack 2.83 2.65 2.47 9" 9"
59030 Reflective Drawstring Backpack 2.16 2.07 1.98 6" 9"
80-59030 Reflective Digitally Printed 3.73 3.64 3.55 5-1/2" 9"
59000 Non-Woven Drawstring Backpack 1.66 1.62 1.57 11" 11"
It's easy to get started with your Custom Printed Drawstring Backpacks. Simply email your vector art file to graphics@kardwell.com and then contact us at 1-800-233-0828.